Living in France for the last 18 months has made me realise how lucky we are in the UK to have good, old, trusty Boots. The variety of products they have on offer for all price ranges along with probably the best points scheme I know of (who doesn’t have a Boots card ey?!) makes it one of my favourite places to shop in the UK as a self-proclaimed beauty junkie. However, I have had to come to terms with the fact that I no longer have Boots right on my doorstep so off I ventured in to the ever-elusive French Pharmacy. Caudalie appealed to me because they favour the use of natural, environmentally friendly products, namely grape seed polyphenols which is the most powerful antioxidant in the plant world and are also against animal testing. I’ve known of Caudalie for a while due to their Beauty Elixir but I’ve haven’t ever felt that that product was quite up my street so instead, I went for a recommendation à la Ms Hirons and went for their Nourishing Body Lotion in addition to picking up their Instant Detox Mask, Gentle Buffing Cream and also threw in a shower gel just because it smelt so dreamy. Um HELLO, the body lotion is incredible. I’m not very loyal to body lotions and I actually find it quite a laborious task so often miss it out but this makes my skin so soft and smooth instantly without that annoying, sticky feeling and it smells gorgeous. I’m also a lover of body lotions that come with a pump dispenser so this was perfect for me. I didn’t find the Instant Detox Mask to be groundbreaking but it was nice to use and my skin felt clean and refreshed afterwards. The Gentle Buffing Cream is a good alternative to harsh exfoliators and AHA’s (such as glycolic or lactic acid) if you have sensitive skin that is easily aggravated. The shower gel obviously does what it says on the tin but I’m obsessed with it purely because of how amazing it smells! All round, very happy with my Caudalie finds. I managed to rein it in a bit here and just went for their Serozinc spray. And I’m so happy that I did. Serozinc is a zinc sulfate solution housed in an aerosol spray can. That may sound a bit huh? And to be honest, it also feels like bit nothing-y (just like spraying cold water on your face, which is actually quite refreshing) but it’s been sooo good for my skin. It’s directed at oily-blemish prone skin types (i.e. me), and I’ve recently been reading up on the benefits that zinc has on the skin which is what made me pick it up in the first place. I spray this on just after cleansing and before any serums or moisturisers and wait for it to dry off. You can also spray Serozinc on to a cotton pad an dab on any areas of concern for a more direct hit (I’ve even given it a go on mosquito bites and it hurrah, it worked!) It clears up the skin so quickly and effectively keeping oil at bay and coming in at under €5, I don’t think I’ll ever be without this again. 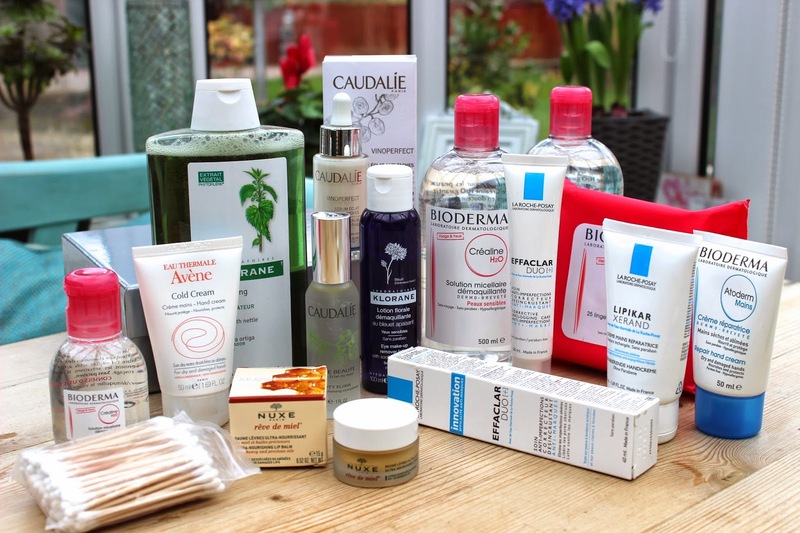 Caudalie and La Roche Posay are also available in the UK. – La Roche Posay is sold at the one, the only, Boots! Yes I’ve heard so many raves about klorane dry shampoo but when I used it I didn’t find it any better than others I’ve used! Caudalie is one of my favorite pharmacy brand ! I’m currently using the Instant Foaming Cleanser and it’s by far the best I’ve ever tested. Ooo I’ve not tried that, I don’t normally go for foaming cleansers but might give it a go!